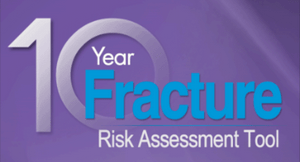 In 2005, Osteoporosis Canada, in association with the Canadian Association of Radiologists, launched the 10-year absolute fracture risk assessment – CAROC. In addition to BMD (lowest T-score of hip and lumbar spine), age, gender, fracture history and steroid use are taken into consideration to determine an individual’s 10-year risk of fracture. The presence of both a fragility fracture and steroid use puts the patient at high fracture risk regardless of BMD result. Version 2, now available for Canadian physicians, uses only femoral neck (hip) BMD rather than the lowest of hip and lumbar spine. This app conveniently provides healthcare professionals with a calculator to determine a patient’s 10 year risk of fracture and a summary of the guideline recommendations for the treatment and management of osteoporosis. NOTE: At this time, not all browsers support the online CAROC tool.